homehealthhygiene.com // welcome to Home-Health-Hygiene - Home -//- Comprehensive Guide and Services to both Self and Food Hygiene, Healthy Eating, Bugs, Illegal Drugs and Solvants, and Hazards! The home-health-hygiene pack is the first of its kind. It will certainly reduce the amount of food poisoning cases in homes across the world and will save many lives. As an associate member of the Royal Society of Health, my aim is to help reduce the amount of food poisoning cases in the home. It has been reported that at least 10Million people are victims of infectious intestinal disease (IID) in the UK each year. homehealthhygiene.com // Home-Health-Hygiene - Comprehensive Guide and Services to both Self and Food Hygiene, Healthy Eating, Bugs, Illegal Drugs and Solvants, and Hazards! The home-health-hygiene pack is the first of its kind. It will certainly reduce the amount of food poisoning cases in homes across the world and will save many lives. As an associate member of the Royal Society of Health, my aim is to help reduce the amount of food poisoning cases in the home. It has been reported that at least 10Million people are victims of infectious intestinal disease (IID) in the UK each year. 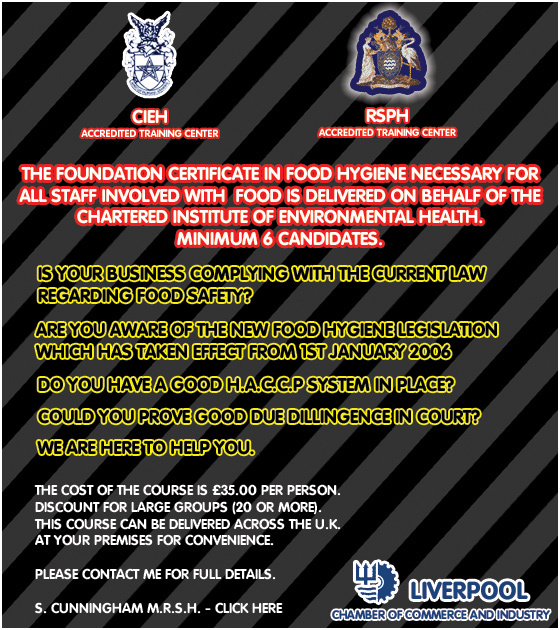 CIEH Accredited RTraining Centre Liverpool Chamber of Commerce and Industry RSPH Accredited Training Centre The foundation certificate in food hygiene nercessary for all staff involved with food is delivered on behalf of the chartered institute of environmental health. minimum 6 candidates. Is your business complying with the current law regarding food safety? Are you aware of the new food hygiene legislation which take effect from 1st January 2006? Do you have a good H.A.C.C.P Ssystem in place? Could you prove good due dillengence in court? We are here to help you. The cost of the course is £35.00 per person. Discount for large groups (20 or more). This course can be delivered across the U.K. At your premises for convenience. Please contact me for more details. S. Cunningham M.R.S.H.